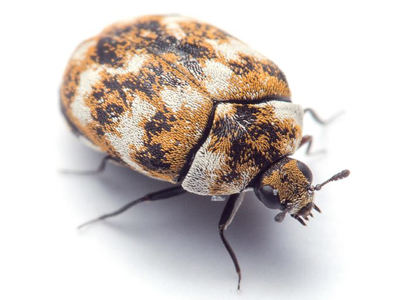 The varied carpet beetle (Anthrenus verbasci) is a 3 mm-long beetle belonging to the family Dermestidae. This beetle in larval form is common in houses. While adults are pollen grazers, larvae feed on natural fibres and can damage carpets, furniture, clothing and insect collections. Adult A. verbasci range from 1.7 to 3.5 mm (0.07 to 0.14 in) in length. The body is rounded, almost spherical. The larval form of A. verbasci are roughly 4–5 millimetres (0.16–0.20 in) in length. The larvae are elongate and densely hairy. The body is covered in a pattern of alternating light and dark-brown stripes. The body is usually wider at the back than at the front and also bears 3 pairs of hair tufts along its rear abdomen. Larvae hatch from eggs in the spring and early summer, often in the nests of birds (including those of the house sparrow and house swift) or around stored fabrics. Adults emerge between late May and early August, flying to and feeding on the pollen and nectar of flowering plants. The life expectancy of the beetle is about two weeks. During this period, mating occurs and the eggs are laid in air ducts, in closets, under furniture, or under baseboards. Once hatched and until they pupate into adults, the larvae hide in dark, undisturbed areas and feed on organic material. The larvae are thus responsible for the damage of various items, such as furniture, clothing, blankets, furs, and carpets. They are commonly found in musical instruments which have been stored for lengthy periods of time, feeding on pads and felts most commonly found in woodwind instruments. Infestations can be prevented by regular vacuum cleaning, dry cleaning or airing clothing outside, placing naphthalene balls in closets, and removing abandoned bird and insect nests attached to the building. Signs of an infestation include the presence of damaged articles, moulted larval skins in dark areas, and an abundance of adult beetles near windows. Control: Treat source of infestation with a pest control dust, diatomaceous earth is a good example. Remove old birds nests and treat area, lift carpets and treat around the edges and underside, around skirting boards, window frames, pipes emerging from lofts or walls and fireplaces using a residual insecticide.